If your family is like mine, you love celebrations. 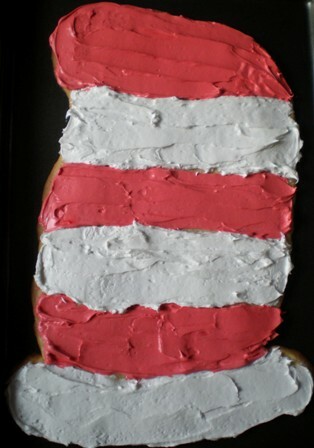 In honor of Dr. Seuss we created a cookie cake in the shape of the famous red and white hat from his legendary book, The Cat in the Hat. We honored Dr. Seuss by reading his books and eating cookie cake – the perfect after school activity to celebrate Dr. Seuss’ birthday. This activity takes approximately 30 minutes and requires the following ingredients: Betty Crocker’s sugar cookie mix, a stick of butter, an egg, vanilla frosting and red food coloring. Make sugar cookie mix as directed. Using wax paper, shape the cookie dough into a hat and place it on a cookie sheet. Bake the cookie until the edges are light golden brown. Cool completely. Place half of the vanilla frosting into a bowl and add red food coloring. Frost and decorate as desired. A healthy alternative is to make a pizza, using mozzerella cheese and tomato sauce to create the red and white stripes. Theodor Seuss Geisel (1904–1991), a voracious reader and distinguished drawer, was born on March 2, 1904 in Springfield, Massachusetts. He has received numerous prestigious awards including the Pulitzer Prize. Theodor Geisel’s literary works impacted the world; he sold over 200 million copies of his books worldwide. His popularity grew exponentially from his literary works as Dr. Seuss. Geisel was saving his real name for serious endeavors. He created his pseudonym using his middle name and the doctor salutation. Ironically, his father wanted him to obtain a doctorate. Geisel once joked that he saved him thousands of dollars. Geisel graduated from Dartmouth and did pursue a doctorate in English literature at Oxford University. He quickly changed his mind and returned to the states after a fellow student encouraged him to leave academia and pursue cartooning. He not only listened to her advice; he married her too. In 1937, he published his first childrens book, And to Think That I Saw It on Mulberry Street. Over the next two decades, Dr. Seuss published 12 more children books (e.g. Horton Hears a Who!) In 1957, Dr. Seuss published both The Cat in the Hat and How the Grinch Stole Christmas (one of his favorite books). Over the next few decades, he continued writing children books, publishing over 30 books in this period. My favorite Dr. Seuss book, Oh, the Places You’ll Go! , was the last book published in his lifetime. Geisel strived to create children books that were both easy and entertaining. He restricted the vocabulary, used repetition and rhyming, and kept it simple so very young children could read his books; he revolutionized children books. His early literary works established him as a reputable writer but his reputation soared in1957 when he published The Cat in the Hat. Dr. Seuss wrote four out of the ten bestselling hardcover children books of all time. They are as follows: The Cat in the Hat, Green Eggs and Ham, One Fish, Two Fish, Red Fish, Blue Fish, and Hop on Pop. Source: “Seuss, Dr.” Authors and Artists for Young Adults, Volume 48. Gale Group, 2003.